I decided not to go to the easiest route and bake a bunch of nummy pumpkin flans. No, I made a deal with myself it had to be recipes that I had never tried before. I started with pumpkin chili. It was wonderful! Rich, thick and multi layered with flavors and spices, it is a delightful soup brimming with fall flavors. 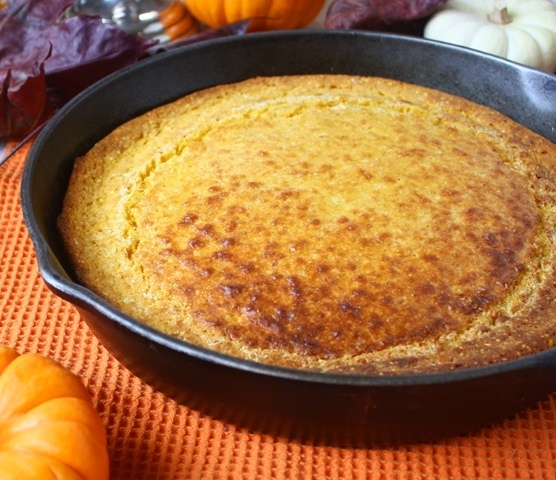 We all know that chili needs cornbread so I whipped out some pumpkin cornbread to go with it. Okay, now the cornbread was completely AMAZING! I just had to make another batch of that it was so good. Next came the pumpkin bars, sweet and moist, bursting with juicy raisins and autumnal spices. Then there was the delicious pumpkin thyme bisque. I squeaked out a batch of pumpkin spaghetti sauce with the last cup of puree. That was served on spaghetti squash noodles. Our house was fragrant with the smells of a warm fire and spices. Fall has officially begun in our house. The crowning glory of pumpkins is that there are only 83 calories and a mega 7 grams of fiber in a cup of cooked pumpkin! They are also a good source of Vitamins C, K, and E, and lots of minerals, including magnesium, potassium, and iron. Pumpkins were aptly represented as the gilded vehicle in Cinderella. It is easy to make your own pumpkin puree to stimulate your fall cooking. The first step is to find a nice fat sugar or pie pumpkin, like “sugar baby” or “Cinderella.” (Cinderella pumpkins look like they are out of a fairy tale. Flat and vibrant orange with pronounced ribs, they are delicious! I saw some at Safeway this year.) Pie pumpkins are very different than the glowing Jack o lantern pumpkins. 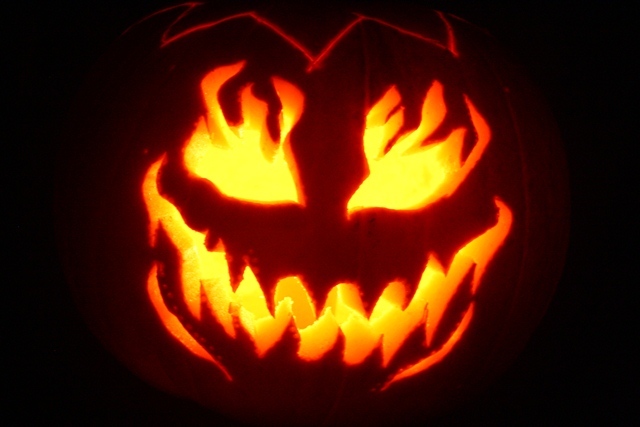 Jack o lanterns are not a good cooking pumpkin. They are grown to carve, not to be eaten. Pie pumpkins are usually smaller and have a thick, short fiber flesh that is sweet. Simply cut the pie pumpkin in half, scrape out the guts and seeds, then bake at 350 degrees, cut side down in a baking dish with about 2 inches of water in it. Bake until a fork pierces the skin easily, about 1 hour or so. After the pumpkin has cooled, scoop out the flesh, (an ice cream scoop works great) and puree in a food processor or blender. And voila! You have the makings of many a fine meal. The puree freezes well so that you don’t have to get crazy and make everything with it. 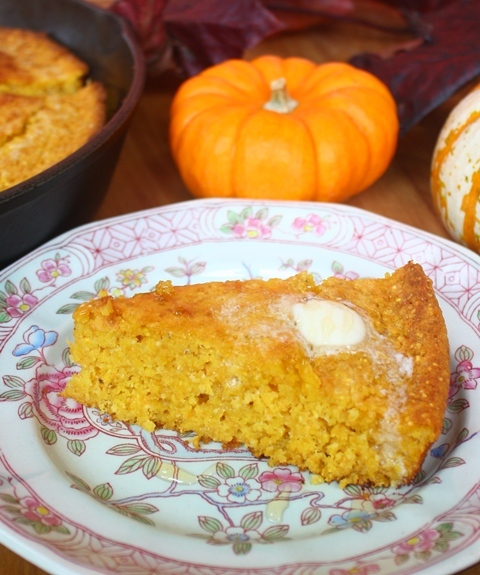 (Like me) Make this delicious corn bread to go with my pumpkin chili and get into the autumn spirit of cooking. Put the pat of butter into a 9 or 10 inch cast iron skillet and tuck in the oven to melt. (I suppose an 11 inch one would be fine too. I don’t think those cast iron skillets follow the measurement rules like baking dishes! If you do not have a skillet use a 2 quart baking dish.) While your skillet is warming up, mix the dry ingredients into the wet till just barely mixed. Don’t overwork it here. Take the skillet or baking dish out of the oven and swirl the melted butter around till everything is buttery. Add the batter then return it to the oven to bake for 25- 35 minutes depending on what size your skillet is. It will be done when the house fills with the fragrance of cornbread and a toothpick, when inserted in the middle comes out clean. Let cool for about 10 -20 minutes, if you can, before serving. Serve with butter and honey. Take out a large caveman type soup pot with a thick bottom. Melt the coconut oil over med-high heat and sauté the onions and garlic till fragrant. Add the ground meat and fry till just barely done. Add the canned tomatoes and el pato sauce. Stir till well blended and beginning to get fragrant. Turn the heat down to medium heat and toss in the veggies (except the zucchini) and spices stirring it up often. Add some water if it seems too thick. Turn the heat down low enough to that this delicious concoction bubbles gently. Simmer, covered, for about 2 -3 hours till all the flavors are married. 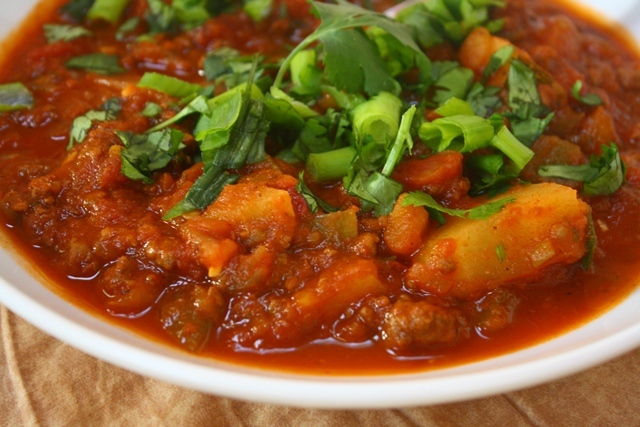 (You can also add this to the crock pot and cook on low for 8 hours or high for 3-4) Add the zucchini and whatever veggies you want to have some crunch factor to them, the last ½ hour the chili cooks. (I threw in my green peppers here too). I always wait to add the salt and adjust the seasonings here. Serve this luscious chili with cilantro and green chilies on top and a bit of cheddar cheese if you do dairy. Happy fall eating! ← Scary things to do to your pizza! Interesting! You could sub out the meat for 3/4 cup whole buck wheat added in the last 45 minutes of simmering. You must try it and let me know! Sounds good! i did see that pie and will hopefully be making it.